Organise all sheets from this section of work into a separate file. Alternatively you may glue them neatly into your Science Notebook. You will submit a "hard copy" of your file for final assessment in this topic. Make an index page and include dates. Number the pages. Task 1 - A expository lesson on the geological history of the Perth Basin. Construct a neat time-line showing the geological events from the breakup of Gondwana to the present day. Use your notes and times from Task 1 as a guide. Use your skills learned in checkpoints 2 and 3 to construct a time line of events in our Perth Basin. Sea levels fall during the last ice age. 7000 years ago was end of this ice age. 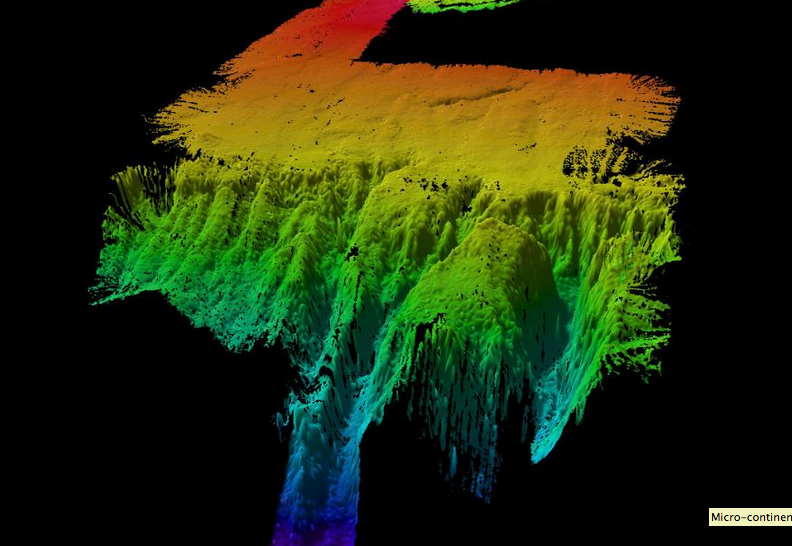 Above is a 3D image from the CSIRO. It shows one of the island plateaus found at the bottom of the Indian Ocean. This looks similar to the canyon off the continental shelf of Perth. If you are interested in continental shelf canyons visit the sites about the Bremer Canyon. Recently there was a documentary on the ABC showing this is a “hotspot” for marine life. The methane released from this canyon forms a reef structure which is the basis of a vibrant ecosystem. A note on Geological drawing. Accurate, neat drawings are a means to increase your skills of observation. As well as this they help communicate your observations to others. From accurate neat drawings we can make inferences about the formation of the structure. Draw with a sharp pencil on blank paper. Show North with an Arrow. A key of rock types or structures is useful too. You will need a plain piece of A4 paper, a sharp pencil and an eraser. Walk quietly to the field site. Keep away from the edge of the road cutting. On your paper draw the North arrow to show the direction of North. Use most of the area of the paper to draw the features in the road cutting. We will first have a discussion about what you observe. Draw a scale, or a figure of a person to give an idea of scale. We will discuss the interpretation of the road-cutting. You will need to recall the geological history from the first lesson. Use the dropper bottle of acid to place a few drops on the rock material. Describe your observations. Explain the implications. Use the trowel to collect some weathered rock material. Place the sample in your white paper bag. Note on the bag your names, the date, the site. 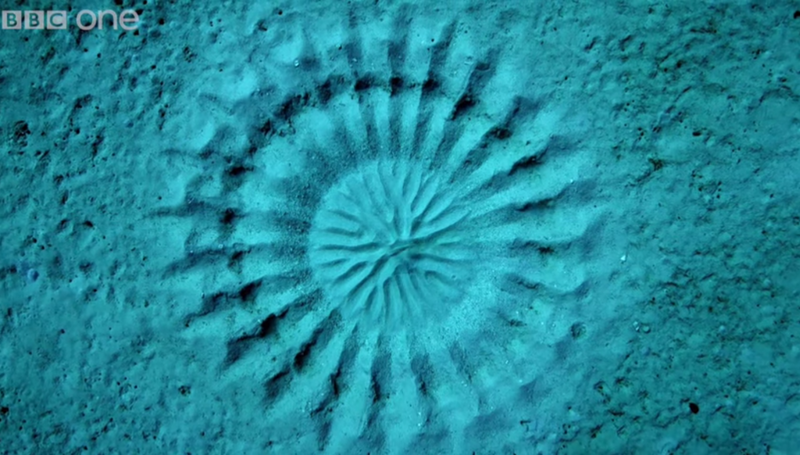 The image below shows a pattern in the sand. Suggest ideas to deduce how this pattern was formed. If we can see evidence, then we can understand how the pattern was formed. “The present is a key to the past” (James Hutton, 18th century Geologist) - natural processes we see happening today (e.g. volcanoes, erosion, formation of sand dunes) also happened throughout geological history. Transverse section through present day sand dunes - Kelso Dunes, Mojave Desert, California, USA. Note the scale at the bottom right of image. 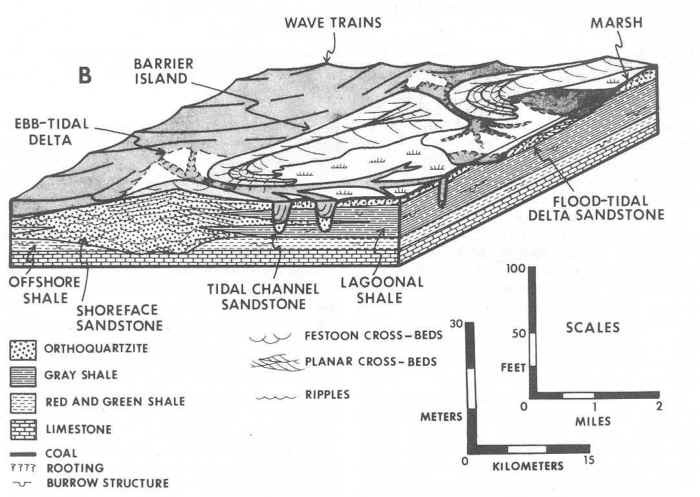 Transverse section through compacted sand dunes. Note the scale at the bottom right quadrant of the image. Transverse section through sedimentary rock that was once dunes. Note the scale. Compare and contrast this cutting to our rock cutting. Describe the features that are similar to our rock cutting. Describe the features that are different in our rock cutting.